This is a beautifully maintained example of the well known Colecraft Boats that has been sailed extensively around the UK until recently. In 2017 she was professionally blacked and new anodes were fitted and in February 2018 the coachwork was completely repainted at a cost of £4500. The boat also has very discreet Fin-Rads fitted throughout along with a heated towel rail in the bathroom, all fired by a webasto diesel heater. The boat was designed with wheelchair access in mind and a wheelchair can pass through the boat without hindrance. As you walk in through the stern you come down into a cabin with two single beds with storage built in underneath, wet locker and a cupboard housing the electrics. There are also handy wooden rails either side for ease of access into the boat. Then you come to the walk through bathroom situated between the two cabins and fitted with privacy doors. There is a full size shower, basin with vanity unit, heated chrome towel rail and electric cassette toilet. There is also a washing machine and plenty of space for air drying. The well appointed galley is next with plenty of storage space, a 12v fridge, 240v freezer, gas 4 burner hob, gas oven and grill, microwave and sink drainer. The open plan saloon area has space for 2 chairs or a small settee, duck hatches to both sides, a Morso Multi-Fuel fire, book shelves around the edge, cupboard space, a pull out table for a computer or eating and again wooden handrails leading out into the Cratch. There is a wooden shutter in the forward cratch area that also drops down into a useful table along with the standard steel lockers with cushions. The boat has either curtains or bung cushions throughout and the gas locker is in the bow locker. There is a good hull survey from April 2017. There is a brand new wheelchair lift available for the boat at £3,500 which is unused and in it's original packaging. 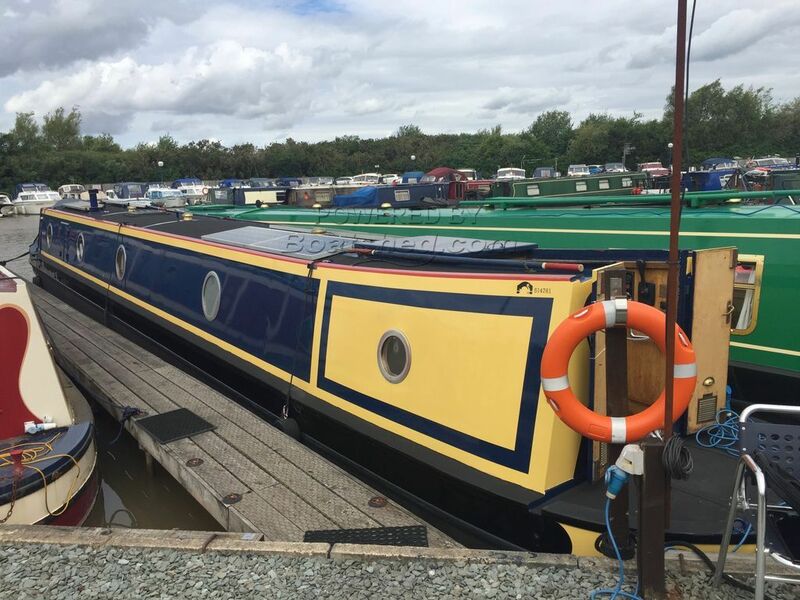 This Narrowboat 57ft Trad Stern has been personally photographed and viewed by Paul of Boatshed Lancashire. Click here for contact details.